(Translation) Carlos Molina, writing in El País: Some of the region’s countries head the global list of those that have done most to enact legislative measures to protect the environment. 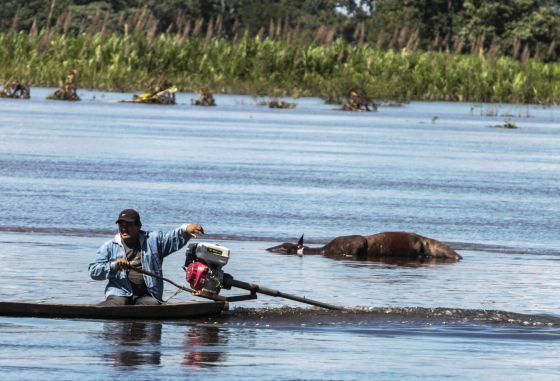 A man struggles through floods in north-western Bolivia. Photo courtesy of Reuters via El País. In some countries in Latin America, attacking nature is a crime, while in others carbon markets and other forms of trading gases harmful to the atmosphere are being encouraged. They are different measures but ones with the same objective: to confront the inevitable transformations in the climate that are being felt across the region, whether in the form of extreme meteorological phenomena such as severe storms, or in less-easily perceptible changes such as rising sea levels. On the positive side, Latin America is the world region which, along with Africa, has done the most in terms of legislating for the prevention or mitigation of climate change, according to a global survey of legislative progress. Among the highlights are Bolivia, whose government has passed the Law of Mother Earth, which penalises mistreatment of nature, and Costa Rica, which recently gave the green light to one of the most ambitious climate laws in the world and has promoted carbon markets as part of its strategy to go carbon neutral within the next decade. Mexico, El Salvador and Ecuador, meanwhile, have adopted strategies to reduce their greenhouse gas emissions, while boosting sustainable development initiatives among their populations. “In Latin America, plans are beginning to transform into concrete legislation”, states the study by GLOBE International, an organisation which brings together parliamentarians from more than 80 countries committed to enacting laws on sustainable and rational use of the planet’s resources. Mexico: Its government announced the adoption of its National Climate Change Strategy (link in Spanish), which focuses on reducing emissions and on cross-sectoral climatic public policies. Costa Rica: Congress passed a Climate Change Framework Law (Link in Spanish), which ensures that the topic of climate change is taught on a mandatory basis in schools. A ministerial decree also led to the creation of voluntary carbon markets. Ecuador: Its government has established a cross-sectoral national climate change strategy. Its National Plan for Living Well (link in Spanish) also promotes sustainable development. Bolivia: The Law of Mother Earth was passed, providing a wide reformulation of the country’s management of its natural resources, climate and ecosystems. El Salvador: A National Climate Change Strategy (link in Spanish) has been adopted, in order to reduce the social and economic impact of global warming. Across the rest of the world the wave of legislative action to counteract the effects of climate change also appears to be gathering strength. The GLOBE International report shows that 61 of the 66 countries studied – responsible for 90% of the world’s CO₂ emissions – have brought in measures to promote clean energy sources, while 54 countries have legislated to improve energy efficiency. All of this serves to reduce reliance on fossil fuels and to improve the environment, according to the study. Even so, there is still much to be done in parliaments across the world. “We should be clear that the legislative response thus far is not yet sufficient to limit emissions at a level that would cause only a 2 degree Celsius rise in global average temperature, the agreed goal of the international community”, says John Gummer, President of GLOBE International and member of the UK House of Lords, in the foreword to his organisation’s report. Climate experts warn that, at the present rate, global temperatures will rise by another four degrees on average by the end of the century, putting a question mark over the survival of future generations and social advances made up to now. Among the greatest losses that Latin America would suffer in a warmer world would be parts of the Amazon Basin, whose eastern and southern regions would wither away slowly but surely. This, in turn, would affect food production over a wider area in South America, given that the Amazon Rainforest generates a significant part of the rains which irrigate crops across Argentina, Paraguay, Uruguay and southern Brazil. “Feeding the world would become difficult under the most extreme possible scenarios of global warming. And it would jeopardise Latin America’s ability to be the granary of the world”, warns Erick Fernandes, a climate change expert for the World Bank. Translation of Spanish original by Carlos Molina for El País. Reblogged this on csrgi . Chile: It’s the politics, stupid!